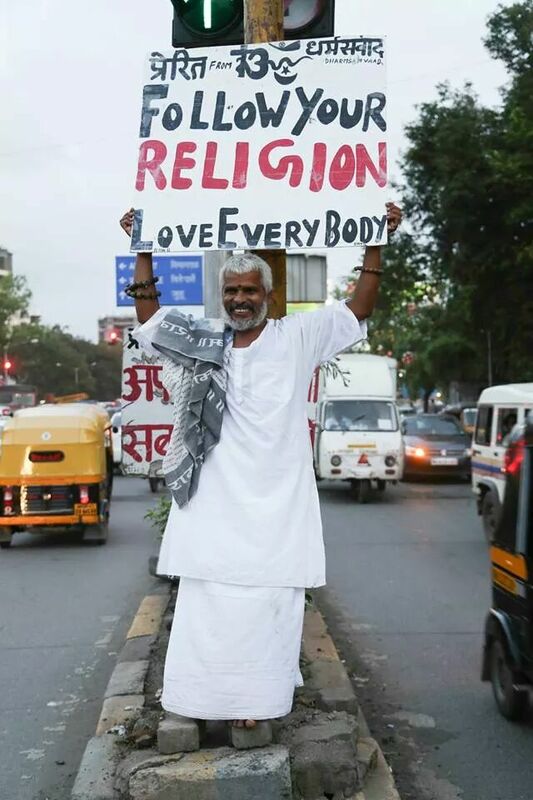 This Man has Been Holding up a sign Promoting Religious Tolerance Everyday for More Than Three Years. (Follow your religion, love everybody)’. “I decided to stand here with a message everyday, after I attended a world religion conference. Every speaker there spoke so beautifully, but I felt that such a small number of people were getting to hear what was being said. The idea came to me when I wasn’t allowed to stand in line to receive blessings at a church. I was also given looks when I went to pray at a mosque. I saw that some Hindu temples say ‘Hindus only’ and the Parsi fire temple at Churchgate doesn’t allow non-parsis. The short film below documents various aspects of his day, the opinions of his admirers, detractors and people who work around the crowded junction of Juhu circle. Such commitment – truly a man to be admired. I think many who see him will be persuaded to think about the issues where they may not have done so before. Love the message. Almost every religion has a variation of the them of the “treat others like you want to be treated.” We tend to forget that overarching message and get bogged down in minutiae which is present in every religious text. We need more people like this man, to remind the people (leaders) of the world about what is more important. We are all a part of the same thing…religious tolerance and acceptance is crucial!